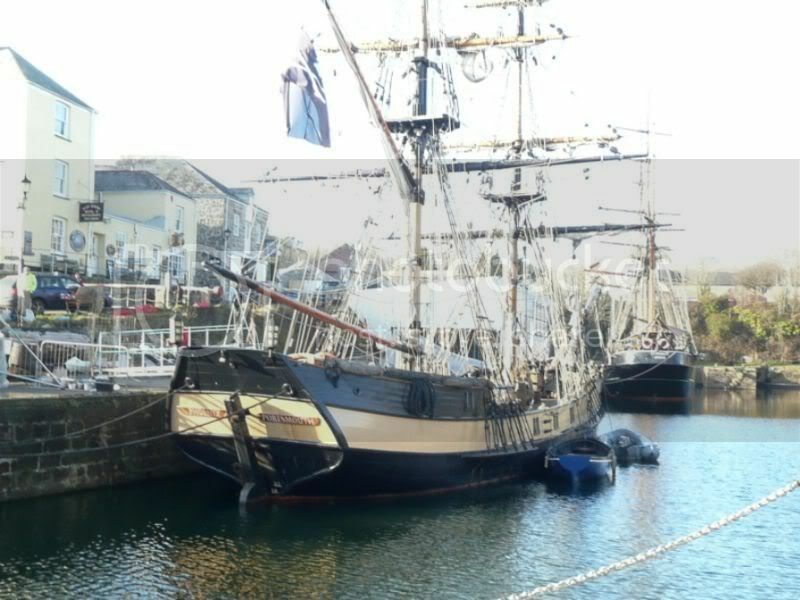 Doctor Who News: Doctor Who: filming update - doing the Charlestown! 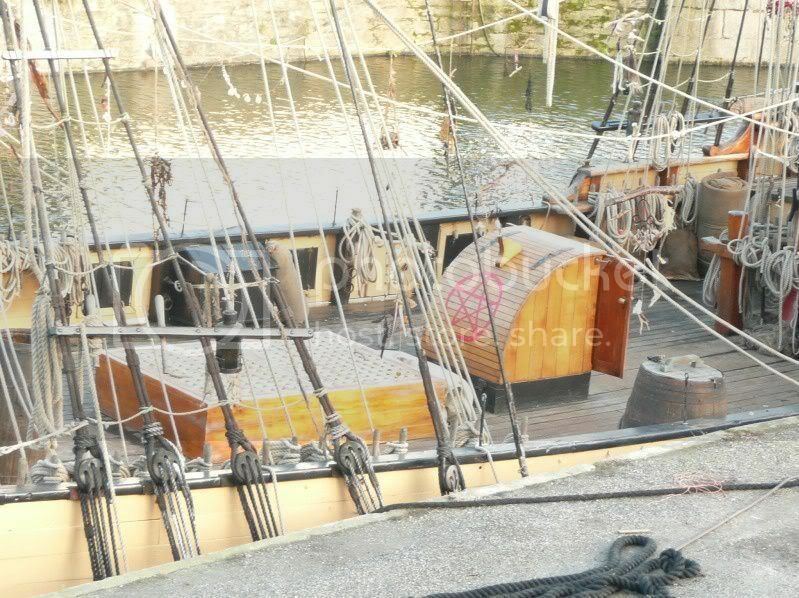 Doctor Who: filming update - doing the Charlestown! 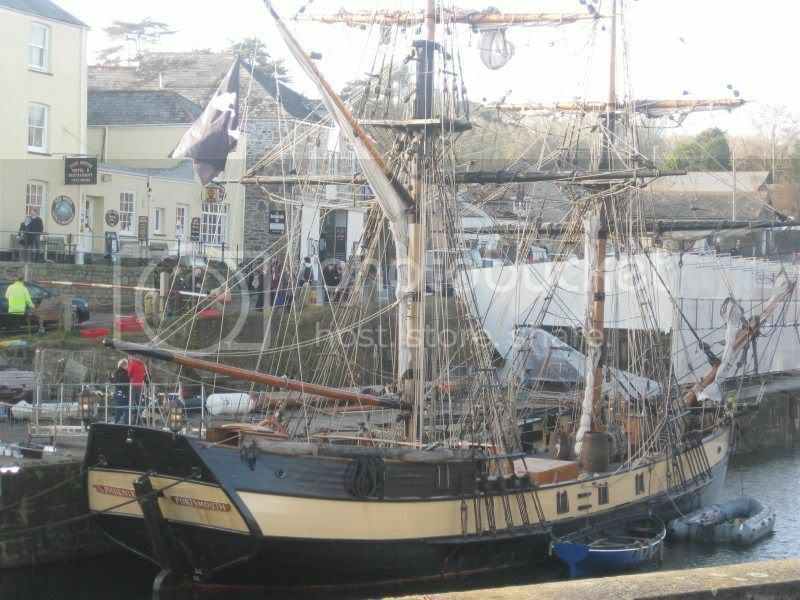 This week saw the cast and crew descend upon Charlestown in Cornwall, where filming was to take place aboard one of the square rigger sailing ships docked at the Georgian harbour. 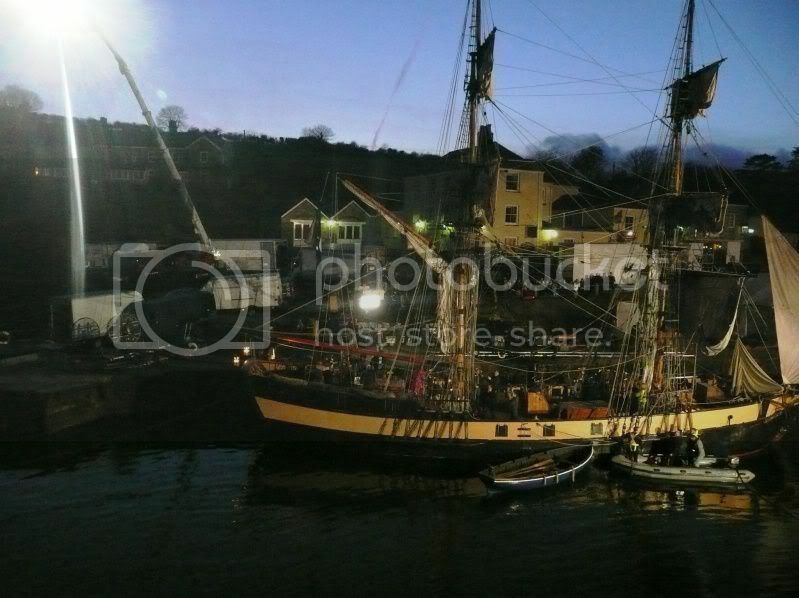 The four day shoot generated a lot of local interest, with the latter days seeing the media and hundreds of fans watching on for glimpses of the series stars in action! 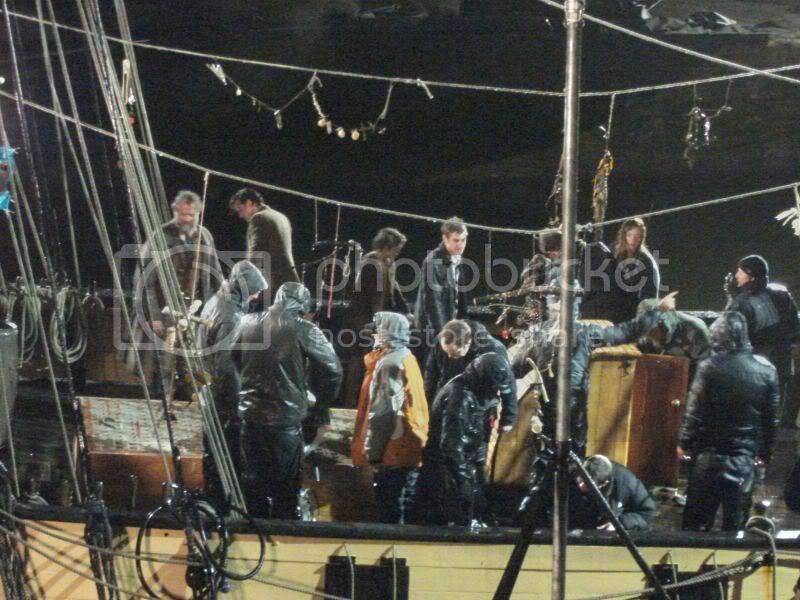 As recently reported, the episode being shot includes guest stars Hugh Bonneville as the "Pirate Captain", and Lee Ross as the "Boatswain", both of which joined Matt Smith, Karen Gillan and Arthur Darvill for the shoot. 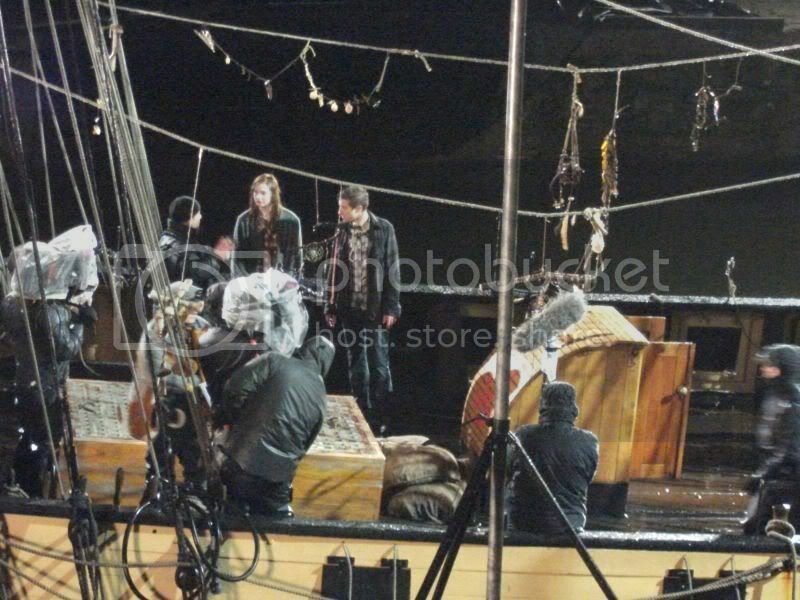 We saw Karen Gillan, the pirates and the stunt coordinators rehearse a scene on board a pirate ship. 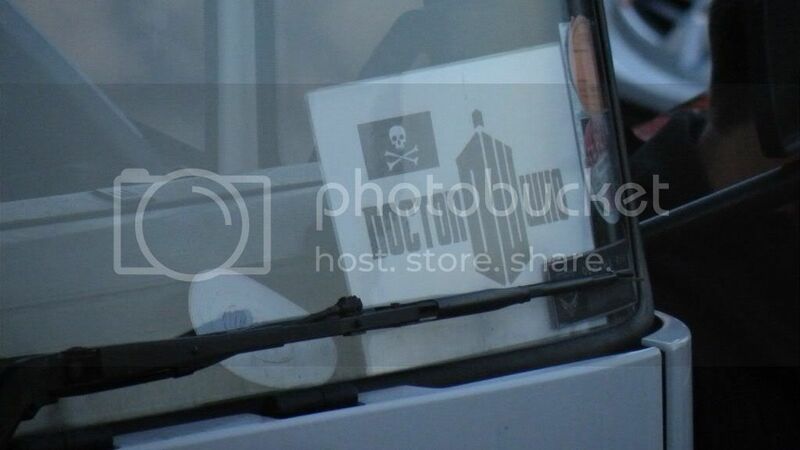 It seems that someone (presumably the Doctor or Rory) has just been forced to walk the plank. Amy fights back but is taken off guard. The bit where she runs and knocks everyone over is meant to be for a rope swing, which there's also a video for. Big location set up. Massive. Huge cast and crew. Dozens of vehicles. 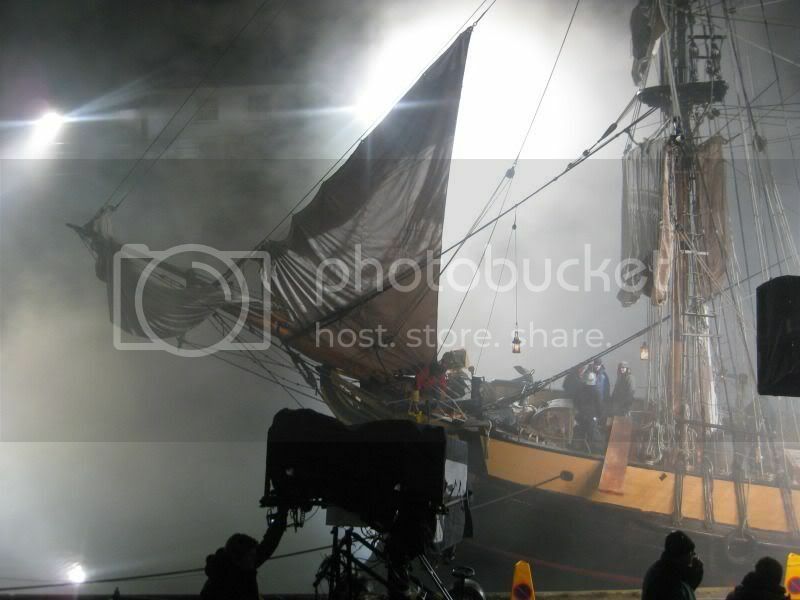 Loads of practical FX - smoke, pyrotechnics, water, fans. The lot. 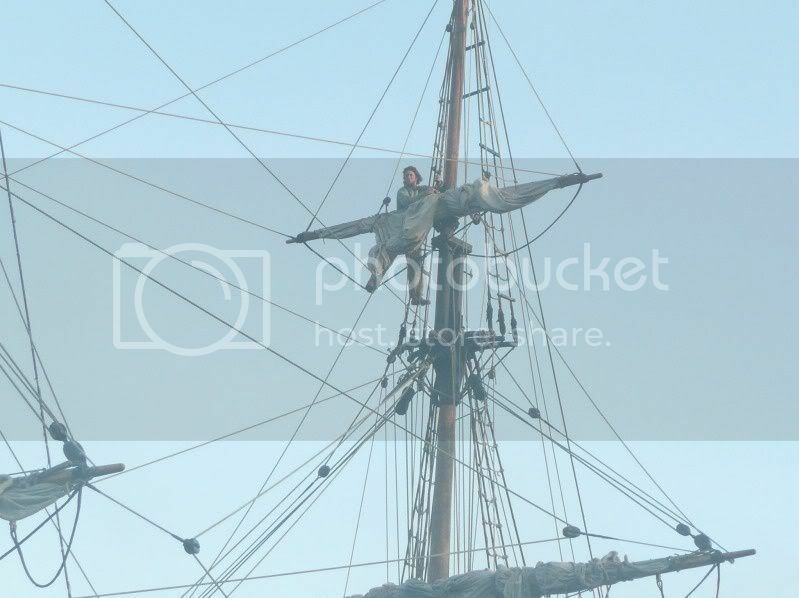 Pirates, swordfights, Amy on a zip-wire, pentagram, divers. 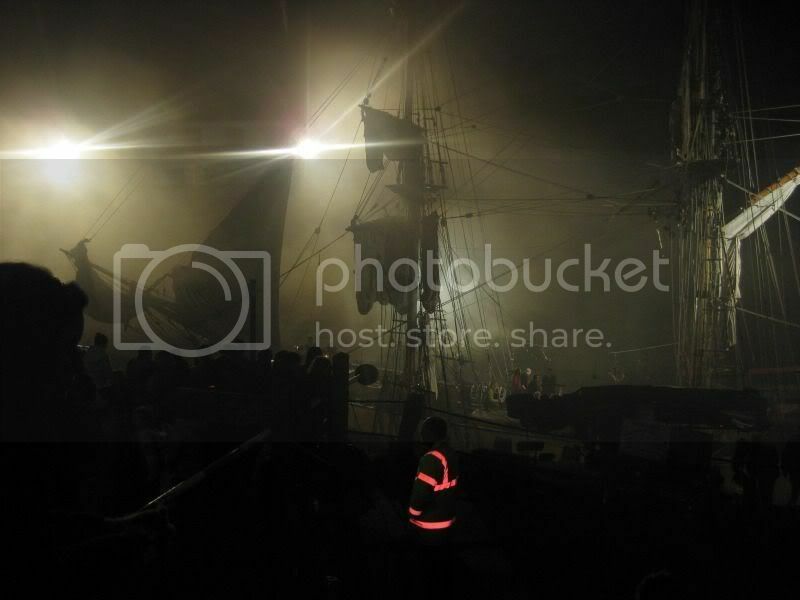 There may be a tall ship in the port, but it's surrounded by several flood lights. 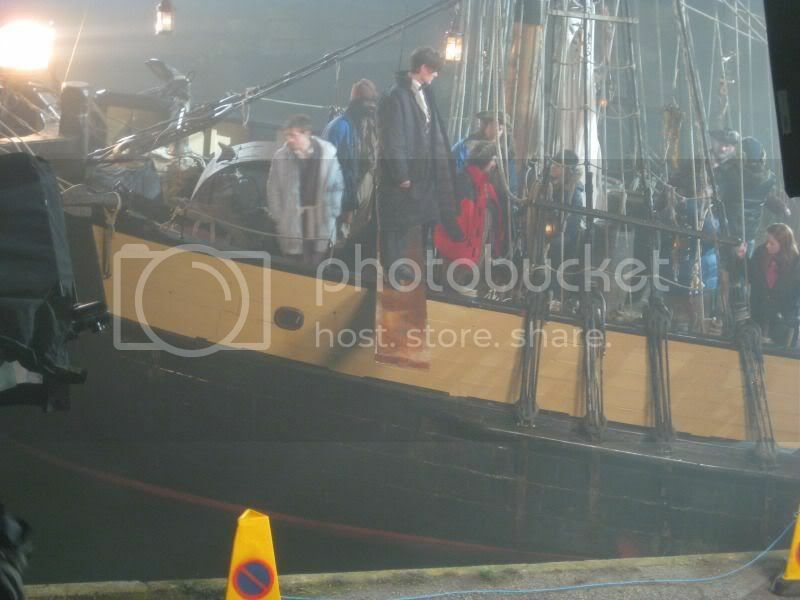 The crew were filming from 4pm on Tuesday 1 February into the early hours of Wednesday morning. Rachel who works at the local pub in Charlestown watched it all happening. She said: "It was a really good experience with all the special effects. If you do want to go down it's well worth it, but be very quiet. We had Alice in Wonderland filming last year, but it wasn't as big as this." 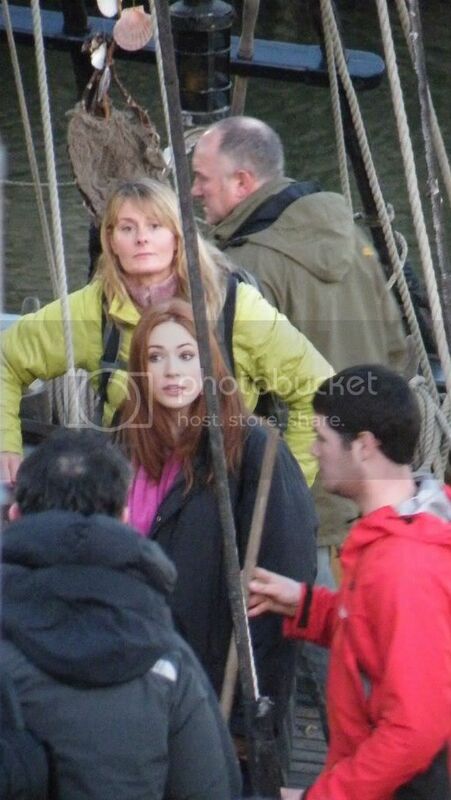 IT'S Captain Who-beard as Doctor's pal Amy Pond fights on a pirate ship in the new series. Amy - played by Karen Gillan, 23 - swung from ropes and fought with a cutlass during shooting on the ship in Charlestown, Cornwall. 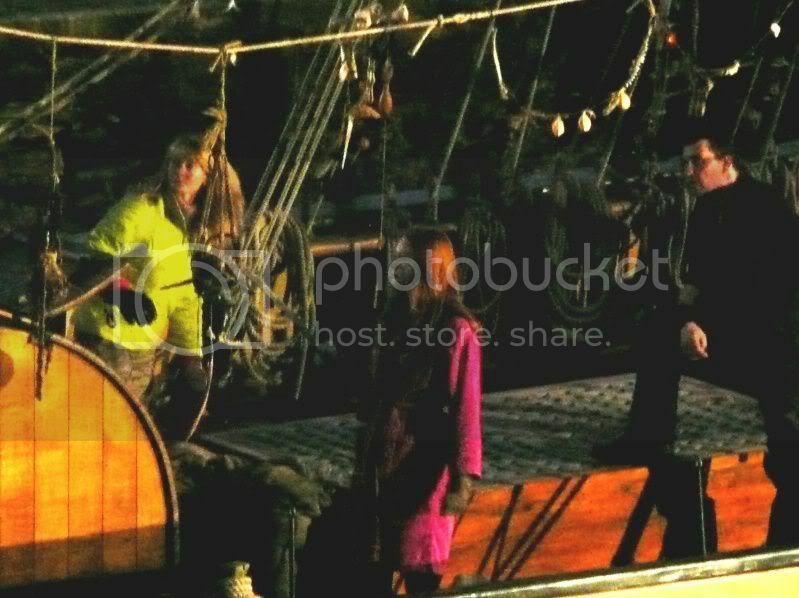 Karen Gillan plays the Eleventh Doctor's assistant and was snapped yesterday rehearsing scenes on board a ship in Charlestown, Cornwall. 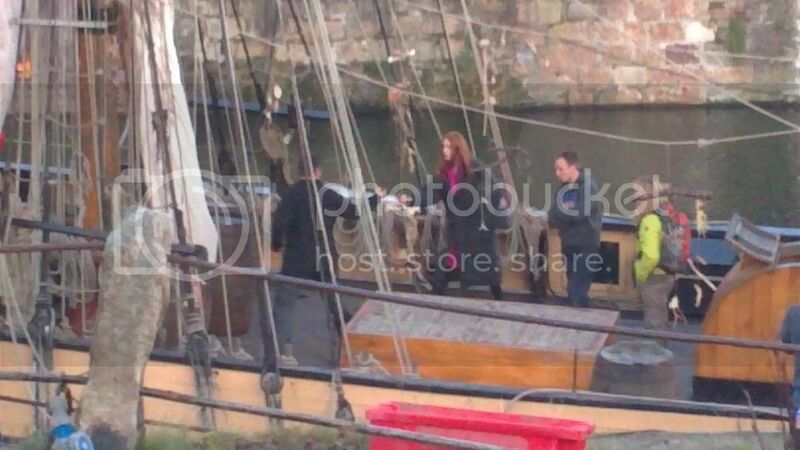 Wrapped in a long blue coat, wellies and a bright pink scarf to keep out the cold February weather, the 23-year-old redhead looked like she was really enjoying herself and she leapt around the ship practicing her moves. The BBC South West programme Spotlight were also on hand to record some of the action and onlooker reactions, which was broadcast during Thursday evening's programme. Massive crowd of onlookers there tonight - couple of hundred easy. 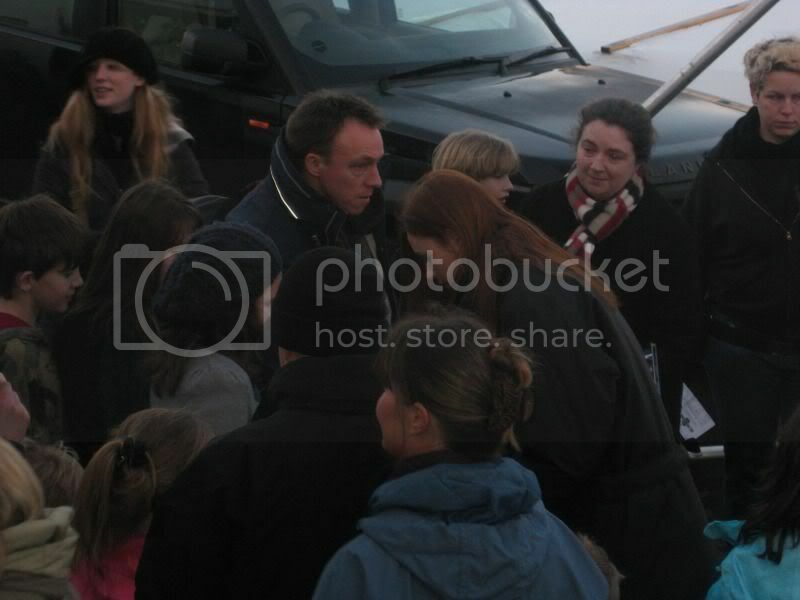 So many, in fact, that the production team stopped proceedings for 15 minutes or so to allow Matt, Karen and Arthur to greet the crowd and sign autographs. Incidentally DWC were filming the size of the crowd, so expect a segment on that in the relevant episode. 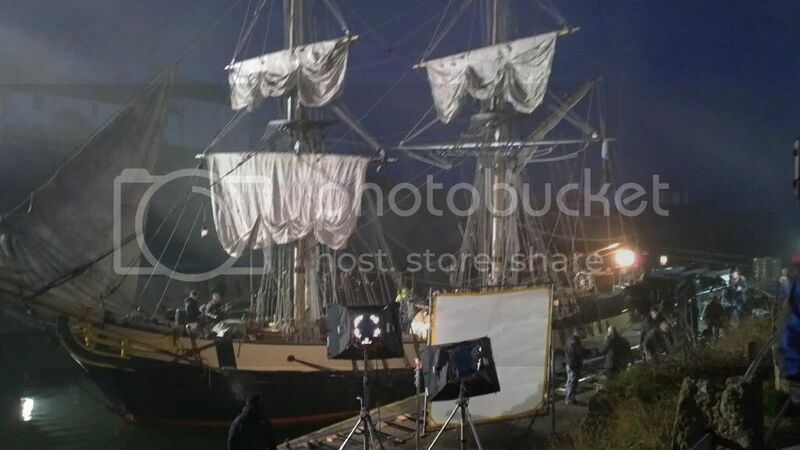 No pics of the filming. 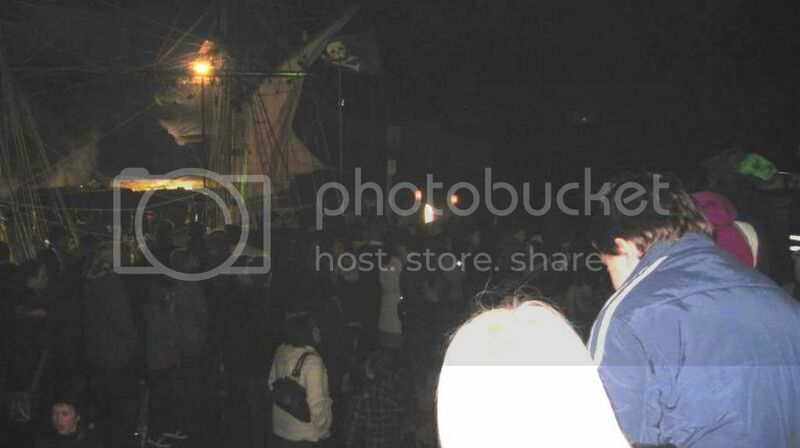 Couldn't get anywhere near (the crowd was six deep! ), but I'm sure there'll be others along in due course. 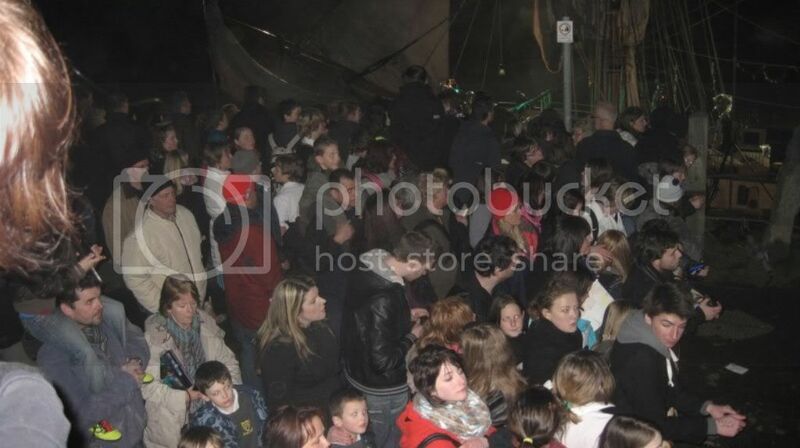 But to convey the scale of local interest in this location shoot here are a couple of shots of some of the crowd. 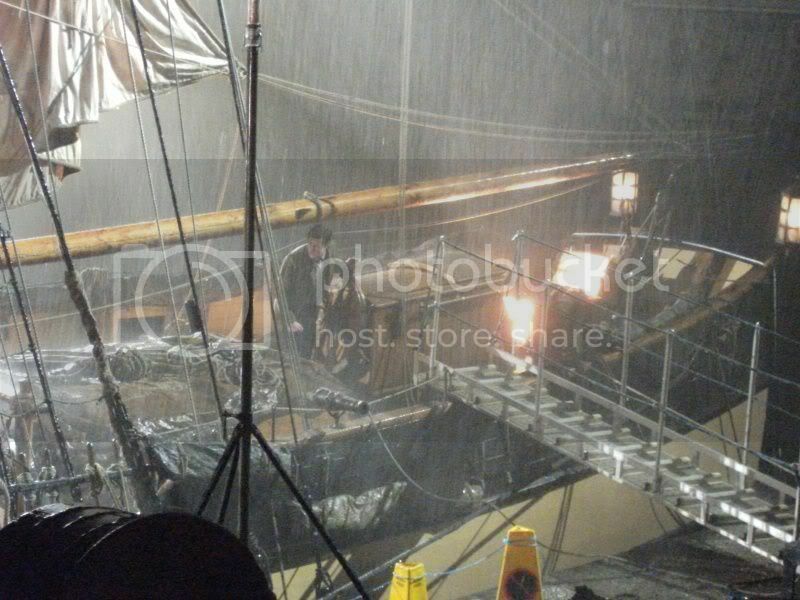 In this video, the Doctor, Amy and Rory battle the elements through the storm. The sirens are also afoot, as are pirate captain Avery and cabin boy Toby. Not sure if it's mentioned but blood seems to summon the Siren, that's why the pirates all use sticks. When Amy threatens the crew with her sword one of them mentions that "just one drop of blood is all she'll need". 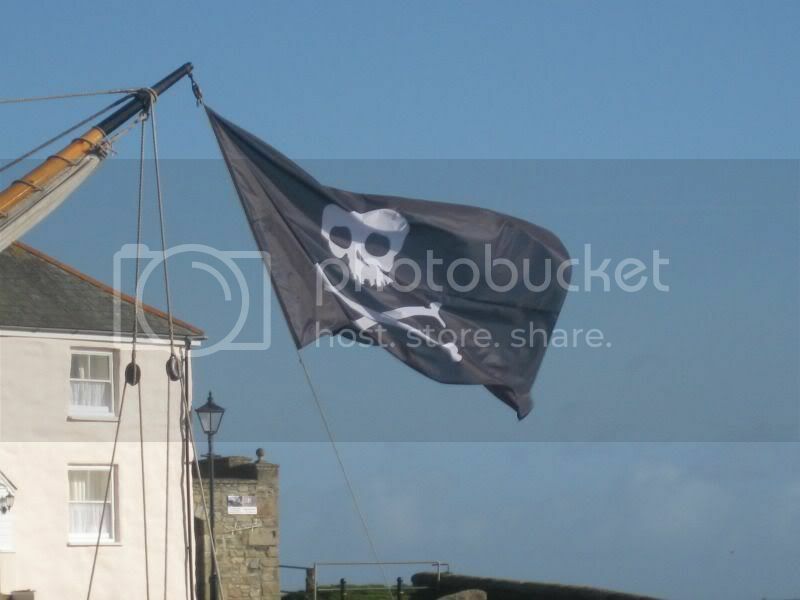 This is Cornwall also published an article on filming, and provided a slide-show of photos from the shoot. 05:05 Bye bye Cornwall. "Bore da Caerdydd. 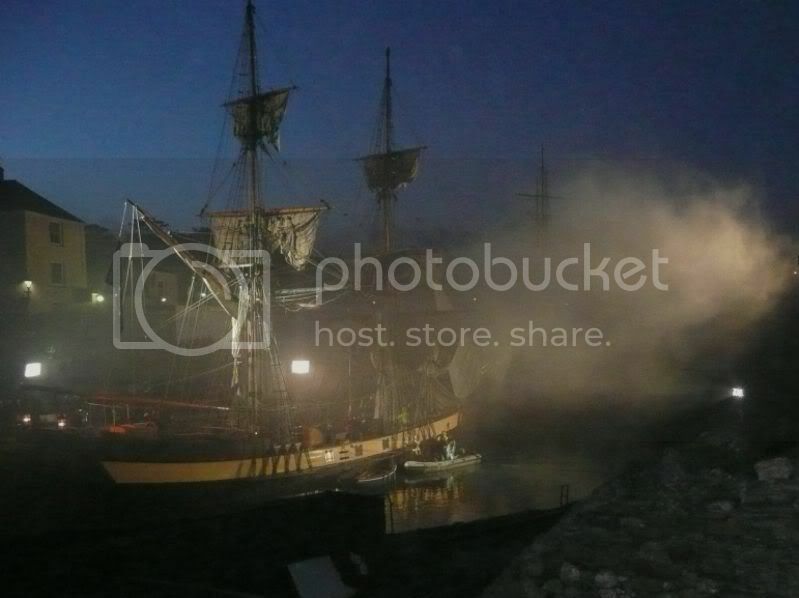 08:16 Filming all night. Not filming now. Tweeting now. Going to bed... NOW.